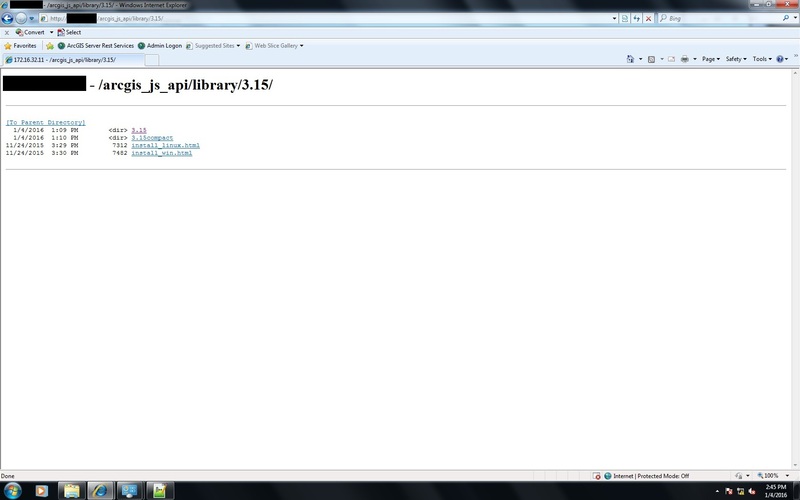 I extracted and copied\arcgis_js_api\library to the C:\Inetpub\wwwroot folder. I successfully tested http://mysitehere/arcgis_js_api/library/3.15/3.15/init.js and was prompted with init.js opening. I am unable to replicate the next step of validating the JSAPI library install using the sample service when accessing it with http://. This is my first attempt at attempting to setup a developer environment and any help is greatly appreciative in determining what I am doing wrong. Thank you. Yea i downloaded the api and how i use IIS u just do what the tutorial says for windows. I change in the init js and dojo js the path miserver/theapi and it doesnt work to me. 'http:' : location.protocol) + '//' + "myserver/arcgis_js_api/library/3.15/3.15/dojo/"
I added /dojo/ to the end of my location in init.js and dojo.js files to now read "localhost/ArcGIS_js_api/library/3.15/3.15/dojo". This appears to have resolved the three error messages I was encountering. Now When I open the sample html I am presented with the "Powered By esri" icon and hyperlink in the bottom right of the map but the map is still blank otherwise. If it is a hostname issue I am unsure what it would be. 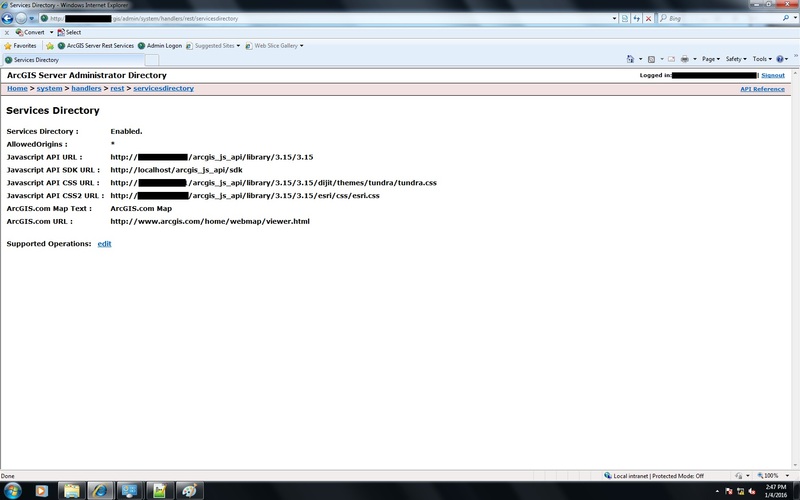 I extracted the API to 'C:\Inetpub\wwwroot' and setup that folder within my IIS Default Website. Can you access your map service for the cached layer? Is the console in dev tools throwing any errors? Also, I would try to use AMD module requires as dojo.require method is considered legacy (shouldn't cause an issue, just a stylistic preference nowadays). //note that if you do not have public Internet access then you will need to point this url to your own locally accessible cached service. w/o the errors, we are just guessing. But here is how I did it. I took a slightly different approach because I have to do this all the time. None of my clients let me go outside for much of anything. I then added them to my resource bundle and then on to the html. Again, I would suspect the directory setup/hostname isn't 100% - check and make sure you have it extracted where you think you have it extracted and the hostname set-up correctly. I had these same type of errors when I didn't have hostname correct. Also, just to make sure... I would check the MD5 hash and make sure the API didn't get corrupted during the download. Esri publishes the MD5 hash on the download page. I have the following, what am i doing wrong? baseUrl:(location.protocol === 'file:' ? 'http:' : location.protocol) + '//' + "[localhost/arcgis_js_api/library/3.15/3.15]dojo"
Evelyn - you probably already figured this out, but the path shouldn't have any brackets, instead should look like "localhost/arcgis_js_api/library/3.15/3.15/dojo". Note also that using "localhost" limits the use of the API to the machine that it's installed on, since any client accessing it will look for it on itself. I agree with Bryan that your path is wrong and the "[ ]" need to be removed. However, I experienced that same error because I copied in the Esri SDK and it kept the same permissions that it had in the source directory and the AppPool user did not have permissions. I had to go into FileManager, Click on the directory above, Edit permissions of the AppPool user and grant read permission. 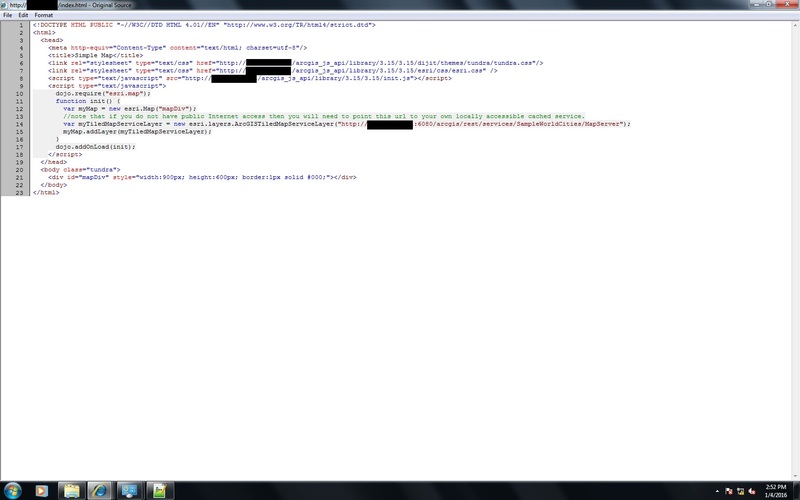 This copied the permissions down through the directory tree solving my issue.